In the last three short years that I have been vegan, supermarket provision has grown exponentially. The availability of vegan options has expanded, not only in shops, but in high street restaurants & pub chains too. Brands are responding to the increasing consumer demand for plantbased meals. Yet, if you are a vegan and choose to cruise on your holiday, you normally need to resort to amending existing dishes the night before. Or often your only option is the “chef’s choice” surprise dish. Vegan desserts can be lacking too, consisting of fruit or sorbet – so uninventive, and so very 90s. But to my delight, I have discovered that P&O have stepped up. They have been very accommodating in the last few years based on feedback from other vegan cruisers. But I’m excited to tell you that P&O Cruises now offer separate vegan menu options – including desserts! You can cruise with P&O and select your vegan meals effortlessly off a menu, how fabulous is that? 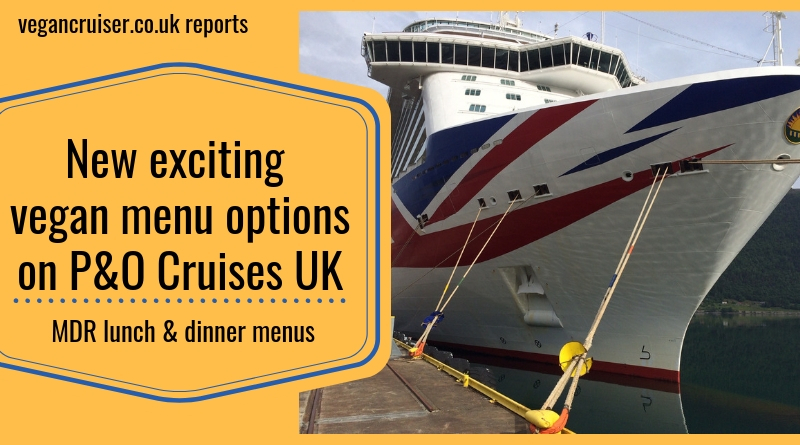 The new main dining room (MDR) menus are now available across all of the P&O Cruises fleet, with the exception of Oriana. The Vegetarian & Vegan menu is on a 28-day menu cycle. This is fantastic news to anyone on a sailing that is longer than a week or fortnight. You won’t need to order from the same menu again on the second week. There is no need to pre-order your meals the night before, like in the past. This separate MDR Vegetarian & Vegan menu is available at both lunch & dinner, consisting of a minimum of two vegan starters, main courses and desserts to choose from. I obtained a list of examples from the P&O PR team – how amazing do the following vegan menu options sound? P&O have kindly put up an example of a daily Vegetarian & Vegan menu up on their website and you can view or download that PDF here. Many thanks to the lovely Sean & Stef IRL onboard Ventura who snapped this menu for me to share.. there’s a vegan soup starter, a chickpea & veg masala main and vegan choc brownie to have as dessert! For photos of dishes from this new menu, please see Tasha92xo Instagram. Tasha kindy collated 54 of her vegan meals from this new menu into one helpful Instagram post! Please follow the link to the actual Instagram post in order to swipe through all the six separate collage images it contains. Buffet dining onboard P&O ships will we improved with designated buffet counters and dietary trained staff who should be able to help guests with their dietary questions regarding meal provision (vegetarian, gluten-free, low sugar etc). In the past, I have already seen excellent separate buffet counters with dairy-free plant milk, cheese, and yoghurt suitable for vegans and those with dairy allergy/intolerance (see Veganolive1 blog post here for more images from a buffet onboard). Whilst the P&O website no longer contains a list of vegan wines, by contacting customer services I was able to easily obtain one. As most cruise lines struggle to highlight even vegetarian wines, it is excellent to see P&O being proactive in detailing vegan wines on their ships. I am not expecting this to be an exclusive list either – do let me know if you know of any more wines on the standard wine list that should be highlighted as vegan-friendly. Wines start from an affordable £4.15 per 175ml glass, champagne for £7.85 and bottles of wine from £16.50. These are prices from January 2019 so are subject to change and availability. 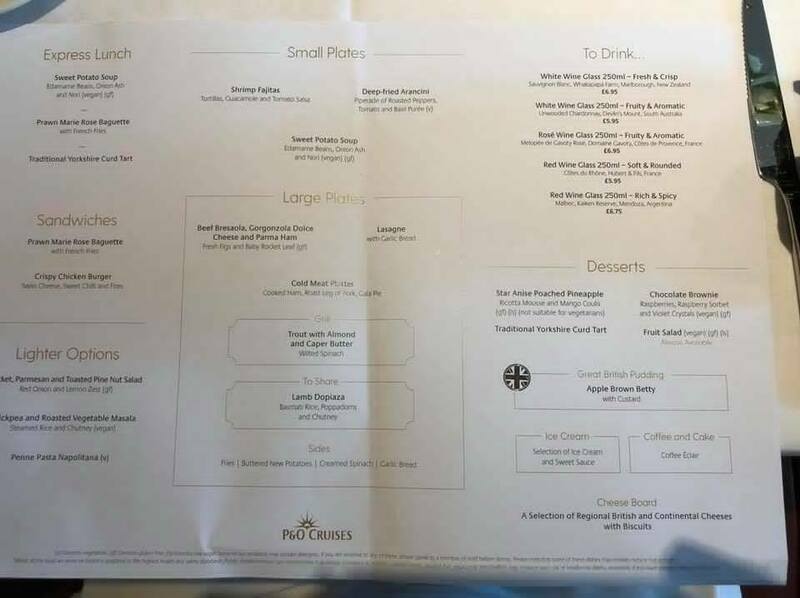 Overall I am super excited for the new menu, not having been able to order off a menu for the last three years of cruising on mainstream cruise lines. 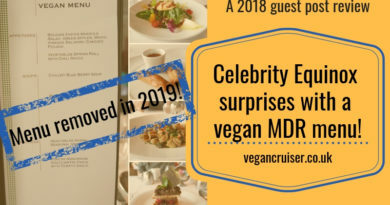 This new P&O vegan menu offer convenience most do not and I am sure this is greatly welcomed by those who opt for vegan options, be it for ethical or allergen reasons. 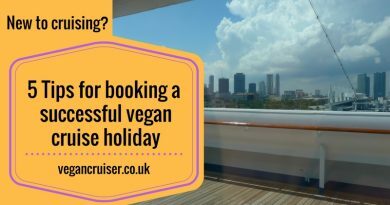 If you sail on P&O Cruises UK and enjoy the menu, please do share your vegan dish photos and holiday experience with me and my blog readers! 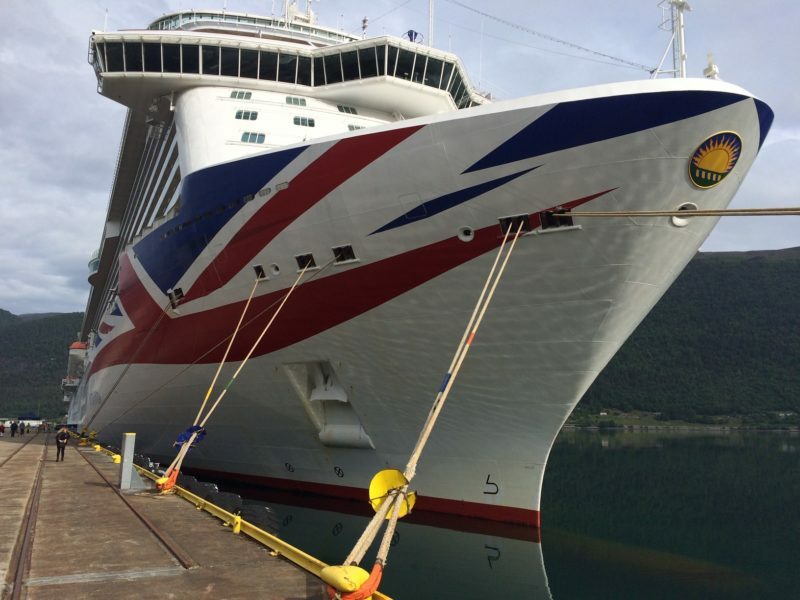 Do come back to find out how Alison, who sailed vegan on P&O Britannia last summer got on her holiday to Norwegian fjords – even before the vegan menu was available. 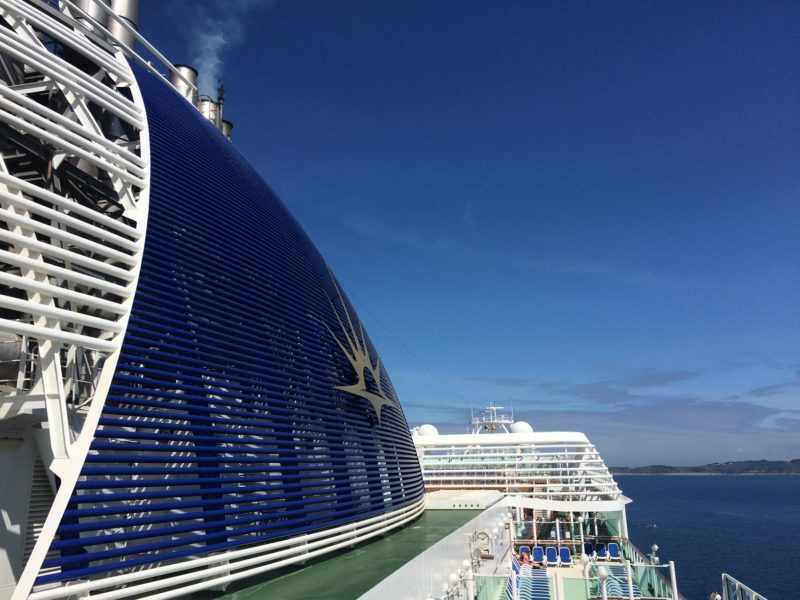 For general P&O insider knowledge, I can heartily recommend you the Holidays at Sea blog whose lovely authors Gav & Luke provided a selection of P&O photos for this post. 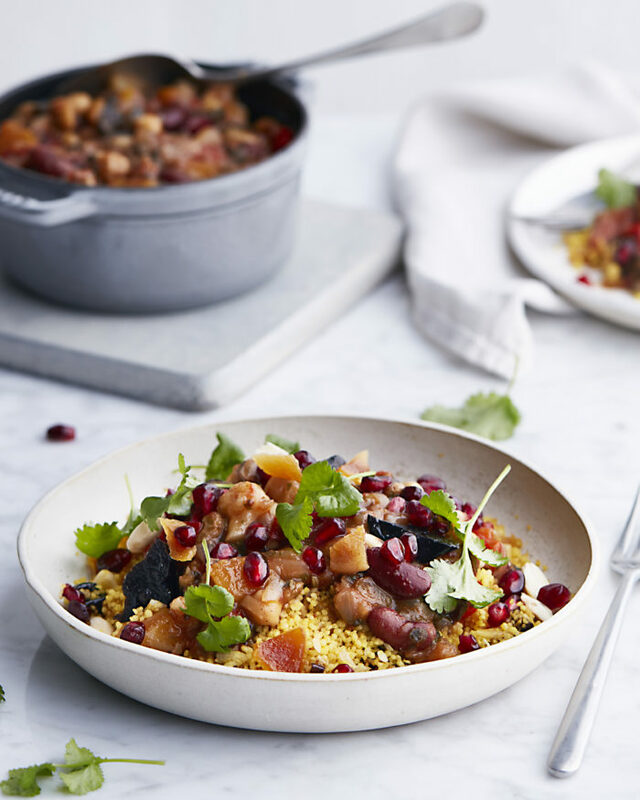 My thanks to P&O PR team for information on the new menu and photo of the Moroccan lentil dish. ← Caribbean Princess refurbishment 2017 & 2019: How good does she look? This is great news, Sanna! 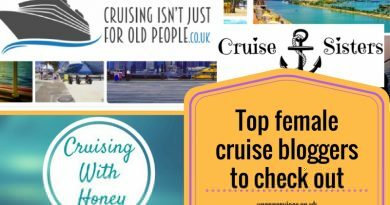 I’ve cruised in the past (not with P&O) and managed by taking along a range of vegan food with me. I’ve reached a stage where I expect a bit more. 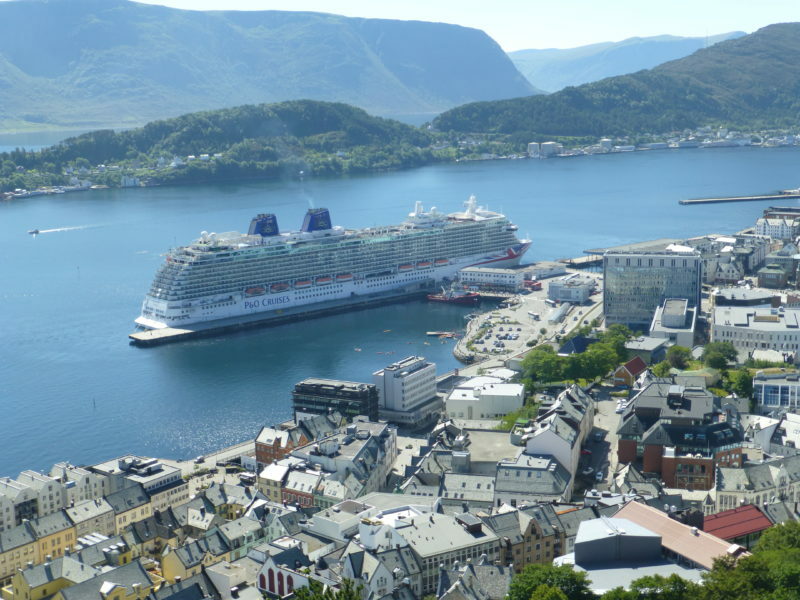 I’ve been thinking about the Norwegian fjords cruise advertised by P&O but had decided to look at the exclusively vegan cruises, however, this does not suit my omnie friend who wants to cruise with me. 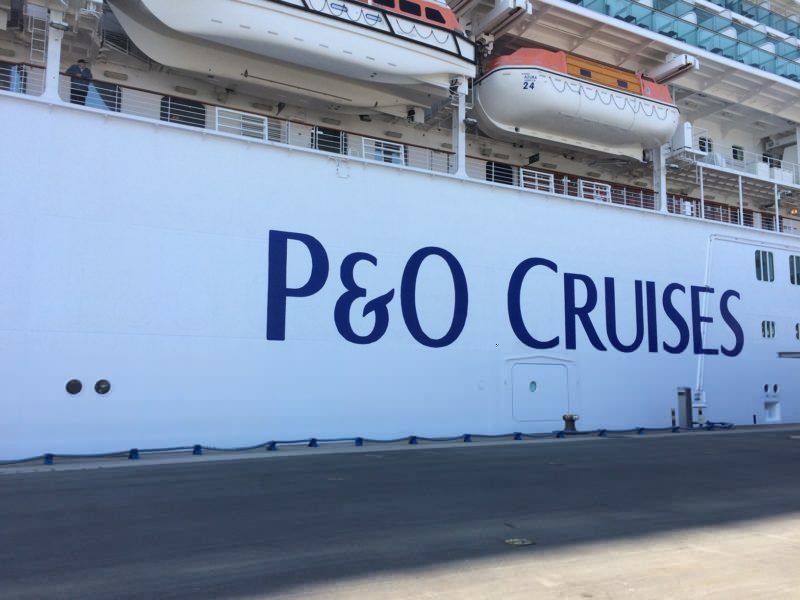 This news has just put P&O back in the running! Wow, this is amazing! Great to see that P&O are moving into the 21st century with such great vegan options! It’s fab to have options at least. Think we’re spoilt here in the UK with such wide range of vegan menu options in our restaurants and the ships are taking a while to adapt to the growing trend.